1) Get a formal diagnosis quickly. You may not be in pain but the sooner that your medical practitioner is aware of your condition the better. You may be referred for an ultrasound scan (sonography) to confirm the diagnosis. 2) Be aware of the risks of a strangulated hernia. In a small number of cases (3%) a hernia may become strangulated. This is a medical emergency and requires immediate attention. The most common cases of strangulation are smaller hernias as the larger hernias tend to slide in and out easily and so are less at risk of being clamped shut by the muscle 'opening'. 2) Get a surgery date. In the UK at least, GP's should refer 'all patients with an overt or suspected inguinal hernia to a surgical provider' according to the Royal College of Surgeons Commissioning Guide 2013. The only exceptions to this are patients who do not want surgical repair or who have significant other health issues. The pain will not go away and although it can be managed somewhat with our briefs, groin pain will likely increase over time. In 90% of cases during a ten year old hernia patient study patients were in pain.1 The earlier you seek surgical attention the better. If you are being refused a hernia surgery date in the UK you may want to listen to Radio 4's Inside Health Programme on elective hernia surgery. Download (25Mb .mp3 file) or consider the economics of private hernia surgery. 3) Your Surgeons expertise in Inguinal Hernia surgery may be a crucial success factor relative to similar operations. A report from the Hernia Outcomes group cites surgical expertise as a factor in recurrence rates and post-operative pain. 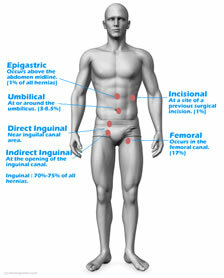 The average surgeon does 21 Inguinal Operations per year according to the most recent study. 4) Consider life-style changes before Surgery. Loosing weight, stopping smoking (both of which are predisposing factors in an inguinal hernia) and are especially good things to do. Increase the roughage in your diet to put less pressure on your abdomen by reducing constipation. Consider Yoga and Pilates and other forms of gentle abdominal exercise. Wear our hernia briefs to gently retain your hernia in the abdomen and stop it expanding. The smaller the hernia the better the surgical outcome. Unfortunately hernias tend to reoccur, either in the existing site or opposite side of the groin which is predisposed to the same muscle wall weakness. The NHS quotes a 10% post-operative recurrence rate. You may need some lifestyle changes to reduce the likelihood of hernia recurrence.